The anatomy of a bee's mouth is complex. The mandibles (jaws) are suspended from the head at the sides of the mouth. 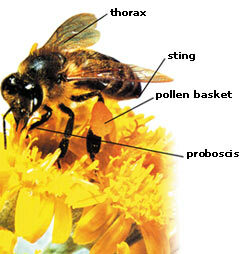 They are used in handling objects, manipulating pollen and in contact with other bees. Above the mandibles is the mandibular gland which secretes a substance once thought to be used to soften wax. 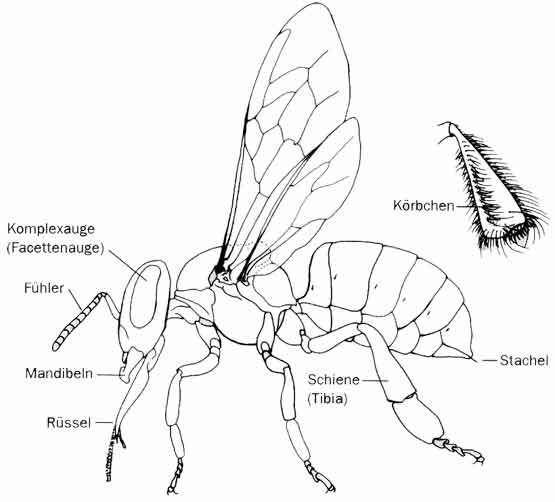 It's now known that the mandibular gland of the queen secretes pheromones responsible for maintenance of the social organization of the colony. The mandibular glands are almost completely reduced in the drone. The front of the mouth is composed of a wide plate or labrum. A proboscis is formed by bringing together several lower mouth parts. The two maxillae and the median labium a movable flap) form the proboscis which is the tube used for feeding on nectar. When the proboscis is not in use, it is folded up under the head.